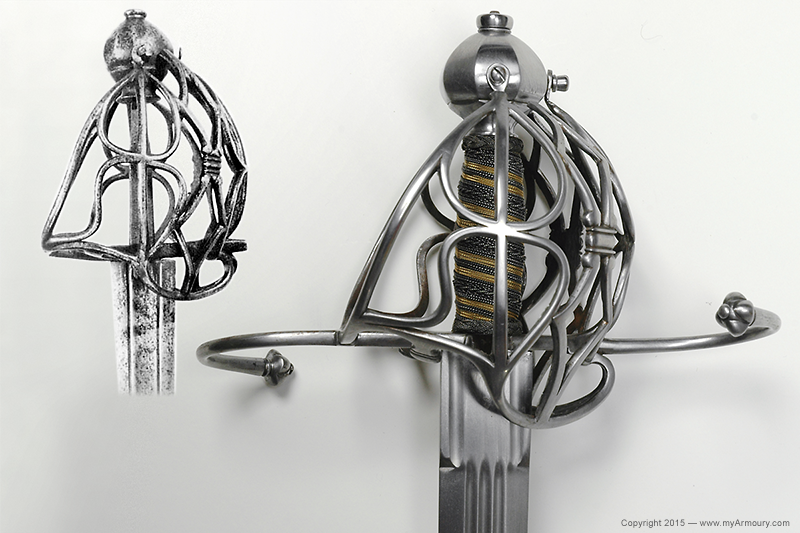 This is my BOAC sword made by Jeff Helmes, along with the original. 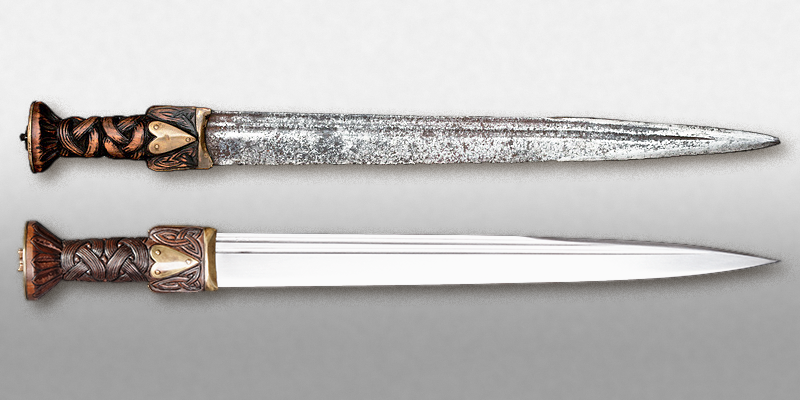 It's not an exact copy - mine is slightly longer (my request), as it only has the inscription once on the blade instead of four times. I also went for silver for the inlay rather than the original gold. I think silver looks better, is far cheaper, and most importantly my 7 year old suggested it's much better for fighting monsters with. Can't argue with that. Blade is a mix of wrought iron and 1095. This is my one and a half hand sword. When Ihave ordered it from the weapon smith, a choose its form from a swiss tomb effigy, so it's the "original", but it was use just an "inspiration" for the work. This piece is based on item X.285 at the Royal Armouries, Leeds, circa 1740 that has a uniquely characteristic brass heart motif. 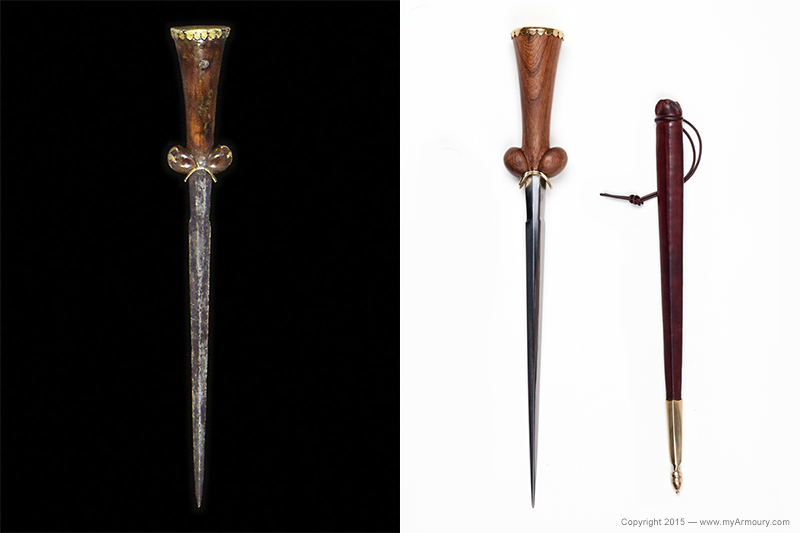 Antique dirk, circa 1740, and its recreation by Vince Evans. An Oakeshott's Type XIV, inspired by an original in the Musee de l'Armee, Paris. An axe of Peterson's Type M, based on an original in Uppsala, Sweden. The overall size and proportions are very close to the original, but the blade details have been simplified as a means to save money. 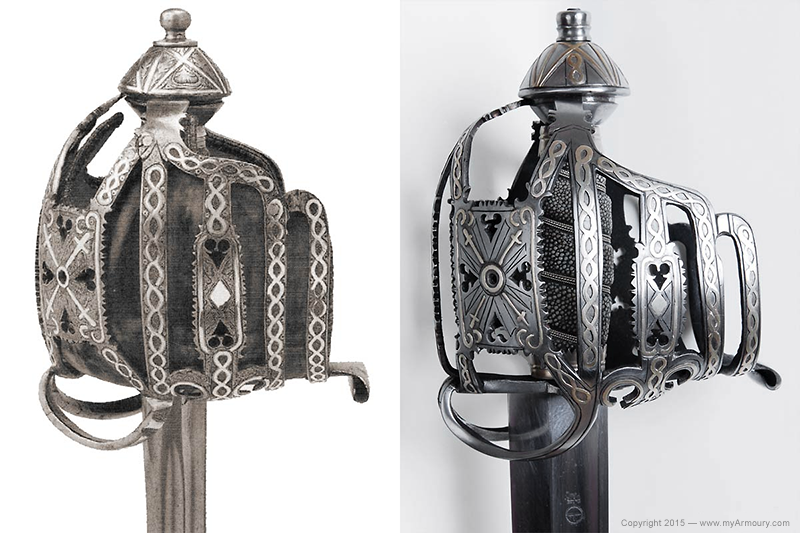 The hilt has simplified design elements compared to the original. Likewise, the blade is missing the gilt gold ricasso. Otherwise, it's a very good representation of a type of dagger rarely produced in the modern market. This piece is inspired by an example from the early 16th century sold in the 2008 auction by Christie's Auction House. The original piece is in excavated condition and has brass sunburst mounts not replicated here due to budgetary concerns. The details on the modern version are a very close match to the antique. The proportions have been scaled larger for comfort. 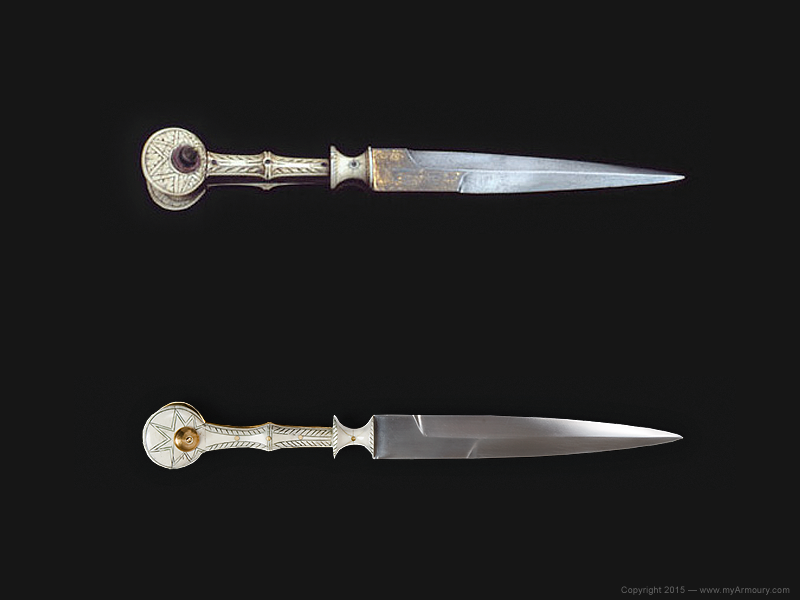 Mid 16th century notation knife from the Victoria & Albert Museum. Replica by Josh Davis of Davis Reproductions. 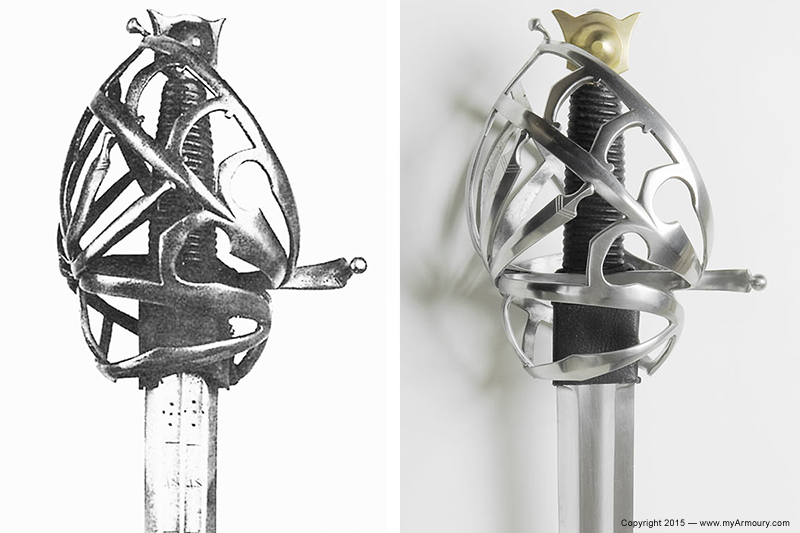 This sword is based on a sword by John Allan I, inscribed Stirling 1716. 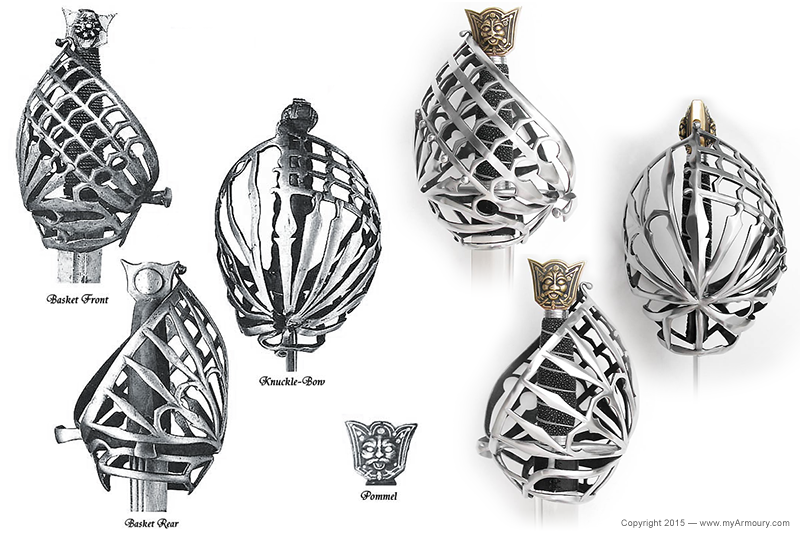 Some of the basket's proportions are more in line with other originals and the scale of the hilt was made to fit requested dimensions, otherwise the design elements are very close to the original. 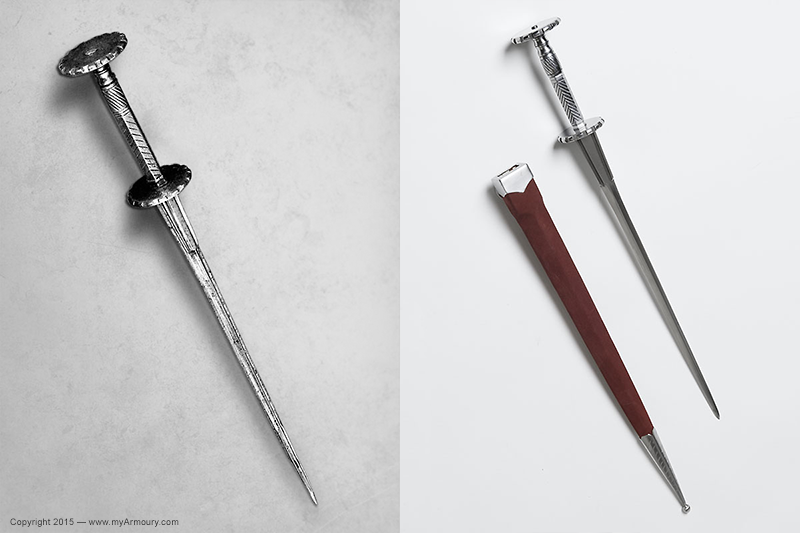 It's fitted to a much simpler backsword blade appropriate to the period, but was not made to match the original. This hilt is based on an example located in the National Museum of Antiquities of Scotland. The original appears to have its quillons removed during its active service. I opted to have the recreation made with the quillons in-tact, replicating how it may have originally left the cutler's shop. 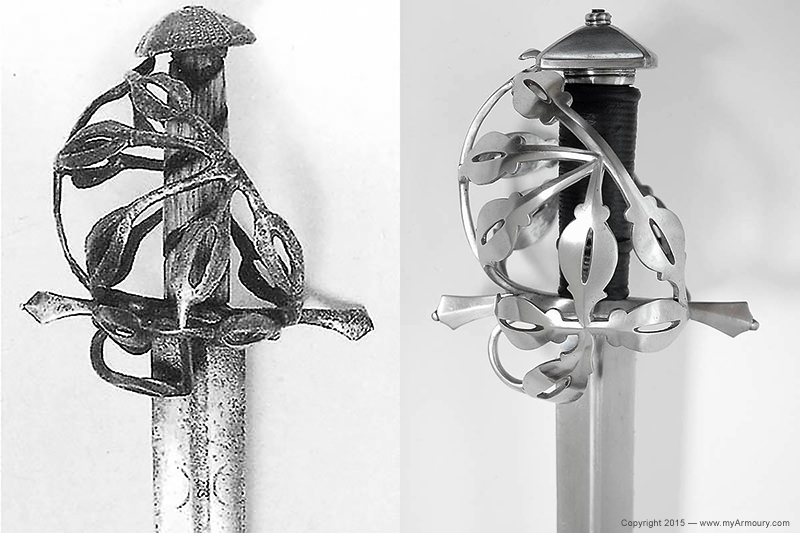 No attempt was made to match the original's blade, but instead another style appropriate for these types of swords was used (though is probably of a later style than the hilt). This one is less of a replica and more of an "inspired" piece. 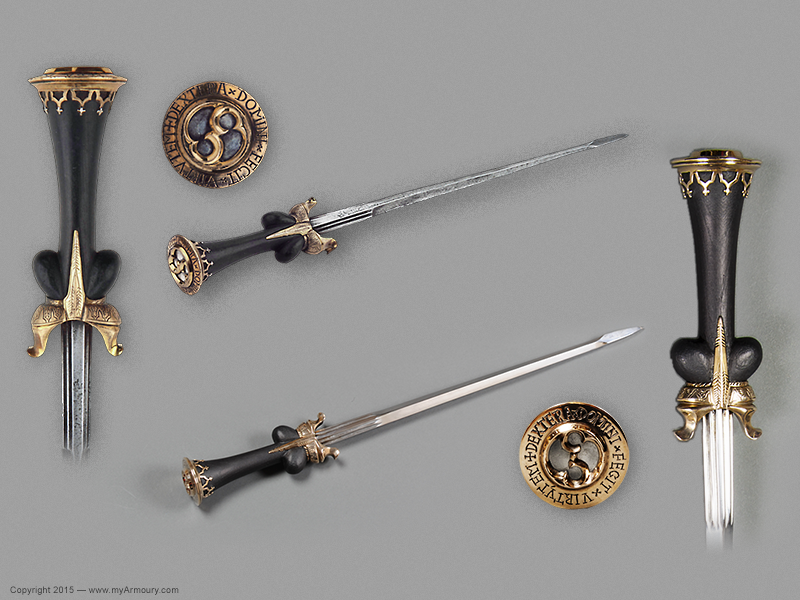 It's based on a sword from the collection of the Duke of Buccleuch at the Boughton House with a hilt from circa 1690 and a blade dated 1662. Looking at the side-by-side, the details are very close to the antique, albeit somewhat simplified, but the overall proportions and shape have been altered. I am not the original owner of this piece so am not aware of the reasons behind the design choices, but looking at the obvious differences makes me pleased with the result. I do not care for the squatty bun-shaped pommel of the original nor the wimpy forward guards. The antique is located at the Edinburgh Museum, Canongate. The basket of the recreation closely matches it, sans the damage of the original. The missing rear guard of the original, something we see often, is present on the new one. 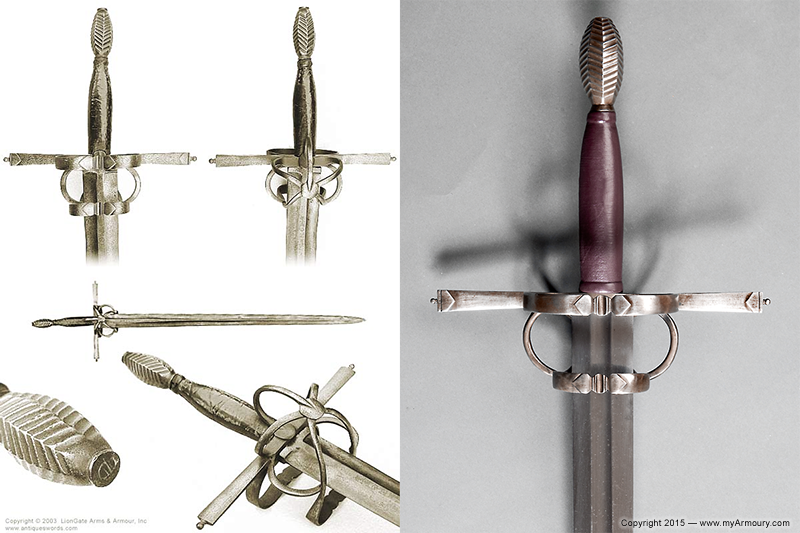 A multi-fullered double-edged blade appropriate for the type of hilt is used instead of the antique's backsword blade. This reproduction is very close to the original. Even the blade was made to follow the antique blade: although we made changes to the strange "axe point" and softened the fuller's termination to make it more appealing. 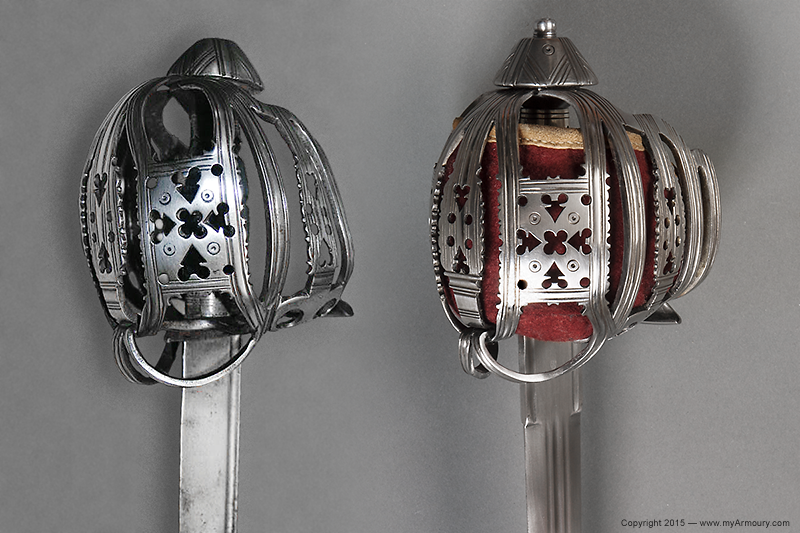 This piece is based on several extant swords such as this one shown here from the Museum of Border Arms and Armour, Scotland. This particular original has a pommel that was too small and sloppy for my liking and a larger, more common style was substituted. 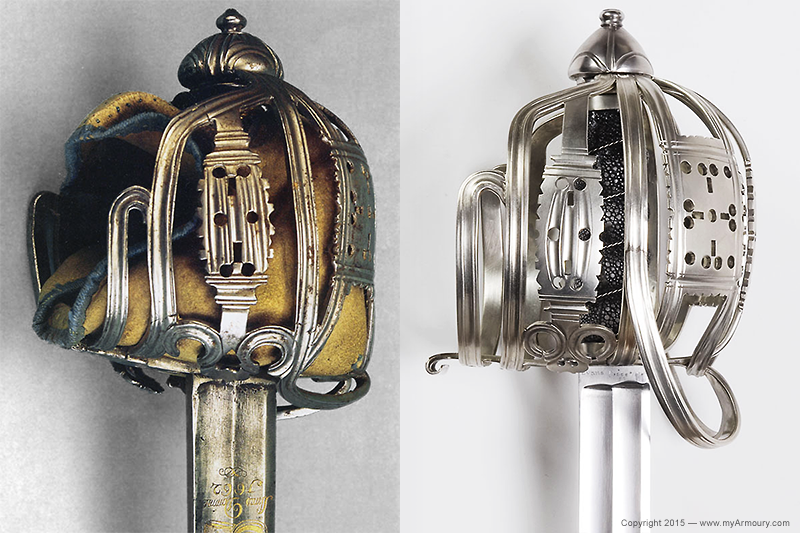 The decorative elements on the pommel were eliminated to give the piece a more workmanlike appearance. 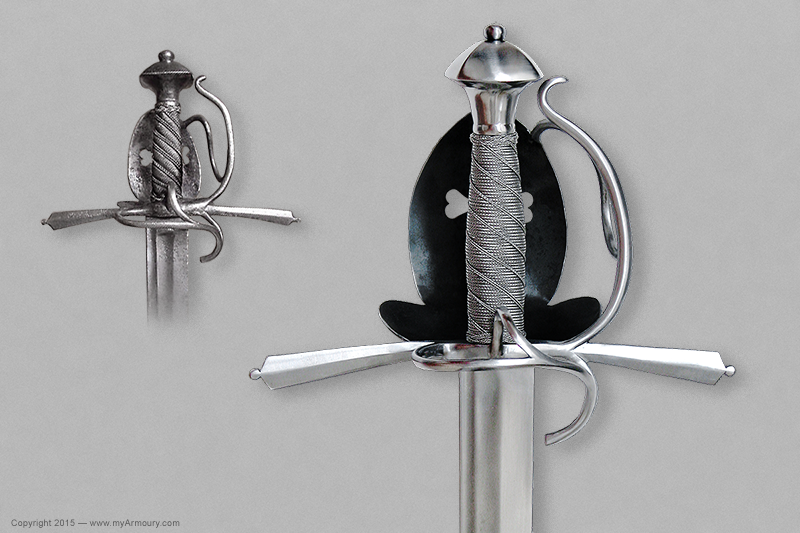 No blade was made in a style appropriate for the time period and style of sword. This sword very closely matches the original with some variance of course. As you can see, the original's knuckle-bow is missing its bottom section. The newly created one shows it as it would have been when new. We borrowed elements from many originals for this one. A lot of Type 1 schiavone are quite crude and lacking of grace, and the design here tried to adopt a style that would be consistent for the period but would be cleaned up and made to be something of a higher quality than the munitions examples often seen. This piece was based on a few different surviving samples but gets most of its design elements from the one shown here. The blade is a much simpler design, having only a single fuller and no markings due to cost restraints. This is an example of a piece that borrows design elements from several originals. The final piece authentic to the era, but was designed to incorporate features that we found most attractive. 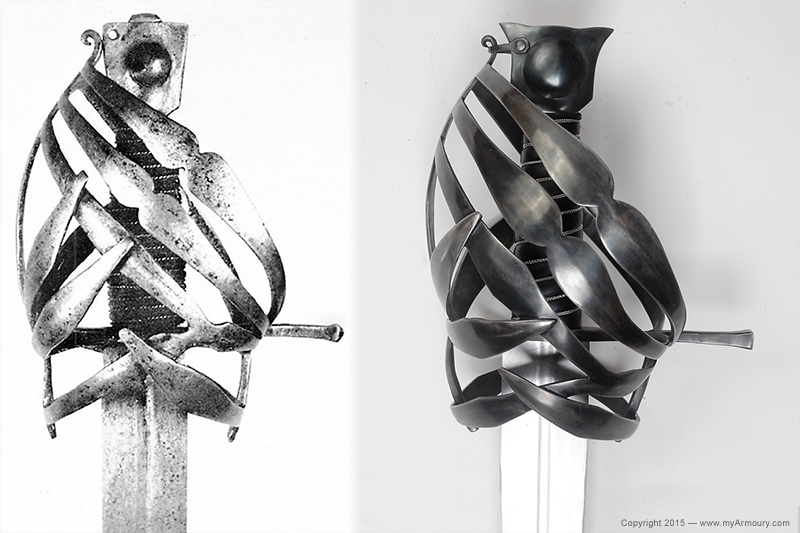 The blade was not modeled after anything specific, but is similar to what can be found on swords from that period. This piece was based on a strange original that is almost certainly a composite piece and probably has replacement pieces made in the 19th century. 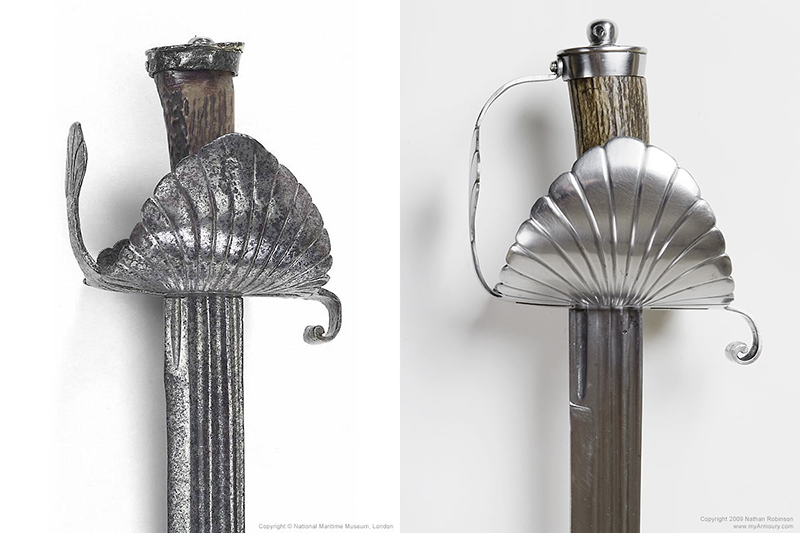 I liked the design and wanted it recreated and the modern hilt is very close to the original that inspired it. We opted to completely stray away from strange blade design of the original and instead fit it to a robust Type XIIIa blade.